In 2014, Korman trademarked its successful Micro-Apartments and MicroSuites platform. In 2012, Korman Residential introduced its Management+ program. Korman secured incentivized management contracts with institutions for assets located in Pennsylvania, New Jersey and Delaware. In the 2000’s, the company expanded its operations through acquisitions of land and apartments in Florida. Since 2010, Korman has transacted $250,000.000 of asset acquisitions and dispositions. In the 1990's, land development continued in PA, NJ, and DE. Hotel development accelerated in Center City Philadelphia and adjacent to Philadelphia International Airport. 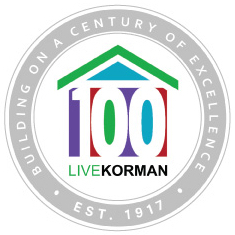 In 1996, Korman Residential was formed to acquire and manage multi-family properties and portfolios. Korman Residential served as third-party manager for two portfolios totaling 2,000 units, in addition to managing the properties in its own equity portfolios. The company acquired Pine Grove, a townhome community located in Hatboro, PA. In the 1980's, office and shopping center development accelerated. Korman entered into a joint venture with Resorts International to develop housing near Atlantic City, NJ. The Builders Group was assembled, which accelerated activity in the company's land bank. The company syndicated many entities in its various residential portfolios. The Plaza Apartments were converted to the Palace Hotel in partnership with Trusthouse Forte. The company partnered with SmithKline and Philadelphia Electric to develop Franklintown, a Center City Philadelphia mixed-use community of public space, high-rise apartments and office buildings. In the 1970's, Korman phased out it's homebuilding business and began it's Builder Program. Korman obtained zoning and use permits to maximize value of the company's land inventory for sale to developers. In the multi-family arena, Korman expanded its extended stay program to meet the needs of its corporate customers. Apartment development continued throughout Pennsylvania and New Jersey emphasizing resort-style living. In the 1960's, major land parcels were acquired for residential and commercial development in Philadelphia, Bucks County, and southern New Jersey. The company entered into a joint venture with Reynolds Metals Co. to develop the largest urban renewal project in the country (comprised of 5,000 homes and apartments, two shopping centers, and a business park). In addition, Korman developed the Neshaminy Mall in Bucks County, as well as the Plaza, a 28-story apartment tower in Center City, Philadelphia, for its own portfolio. Korman also assembled sizable tracts of land in Pennsylvania (Center City Philadelphia, Montgomery, Bucks, and Delaware Counties) and in New Jersey. These tracts, in part, provided sites for three major PUD developments containing over 10,000 homes and 6,000 apartments. Ultimately, Korman served as third-party manager for over 2,000 of these apartments. In the 1950's, large scale residential & commercial development continued in Philadelphia and Montgomery County, PA. In the 1940's, Hyman Korman, Inc. continued residential and commercial development in Northeast Philadelphia. The Kormans purchased Frankford Supply Co., which became the major building material supplier in the Delaware Valley. Lansdale Brick Co was acquired during this period, as was BMPD, Inc., the wholesale distributor for building materials. In the 1930’s, the company added apartments and shopping centers to its home building business. In the 1920’s, he began acquiring additional farms and subsequently incorporated to build homes in larger developments. In 1917, Hyman Korman acquired the Hamilton Farm in Northeast Philadelphia for residential development.